When it comes to thinking up crazy things to do with cars, the guys over at Garage 54 in Russia never disappoint. 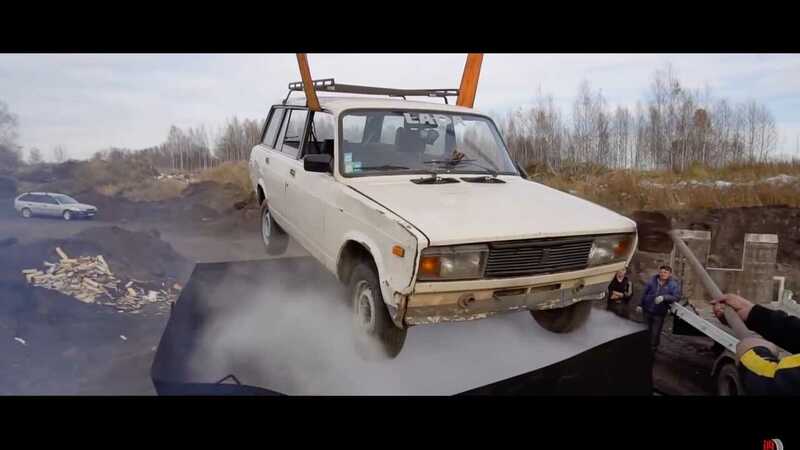 This time around, Vladamir left an old Lada at headquarters, which was a very bad idea. Having blown up and burned cars to the ground, they’ve done quite a number of questionable things to automobiles. With the Lada just sitting around, the crew thought it would be a great idea to boil the car. Yes, that’s right – boil. The thought of boiling a car is insane and it’s exactly the kind of thing Garage 54 does best. Finding a makeshift pot to put the Lada in isn’t exactly easy to find, so the boys take a cylinder-shaped silo and cut it in half. Next they take the two halves, lay them next to each other with the insides facing upwards, then weld the two pieces together to form a tub. The welded tub was further strengthened with support braces all around to make sure the car and water doesn’t escape. The tub and car were then transported to an isolated location out in an open field. Filled with approximately 10 tons of water, it was time to start boiling. A large amount of charcoal and firewood find their way under the tub soaked with gas to start up the fire. Once the fire gets going, the Lada is then dropped into the tub of water. After six hours of boiling, salt, pepper, and other spices are added to the Lada soup. Even some noodles were thrown in for good measure. After a few more hours, the cooking process has come to an end and the Lada soup is ready to serve. A small sample was poured via a built in tap and it turns out to smell like actual soup. We just hope the crew didn’t actually consume any. With the car pulled out of the broth, it sort of looks cleaner on the outside than before, however the interior looked it a bit crispy and not in a good way. We wonder what Vladamir will say when he comes back to his boiled Lada. Merry Christmas?